Izy Hossack isn't your regular 18 year old. Since her early teens she has been developing delicious recipes and styling and photographing them with a flair well beyond her years and recording it all on her blog Top with Cinnamon, her site has received international attention and was shortlisted in Saveur Best Food Blog Awards 2013. 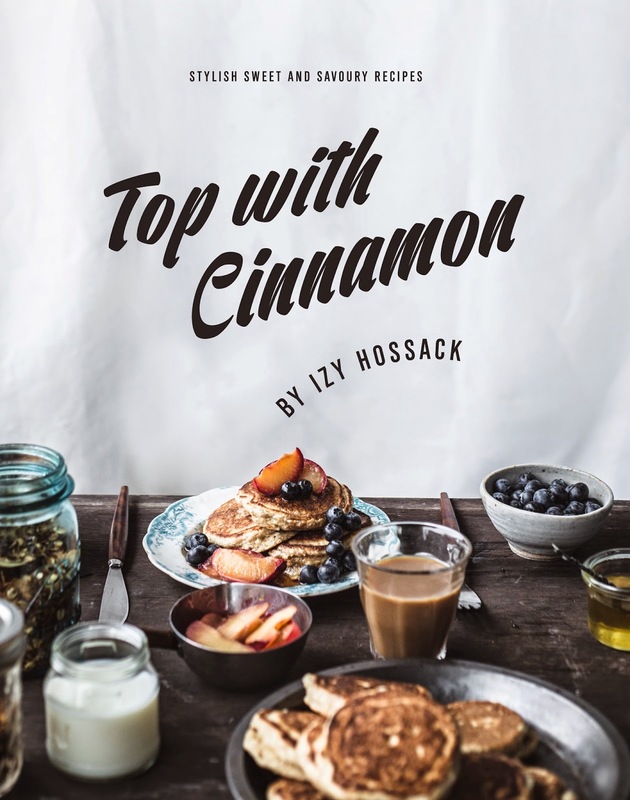 Izy has compiled a collection of her favourite recipes for all occasions in her debut cookbook, Top with Cinnamon. Here she showcases her impressive skill for food photography and styling as well as her natural ability to produced delicious, wholesome recipes. Featuring some gluten-free recipes and healthy options, as well as step-by-step how-to;s, Top with Cinnamon has something to suit everyone - this is approachable, flavoursome home cooking with a modern fresh twist. Breakfast includes Coconut Berry Pancakes, Cornbread with Cinnamon Sugar, Cranberry and Flaxseed Scones (see below) and Wholemeal Maple Pecan Buns. Sides features Chickpea and Pomegranate Dip, Squash Feta and Sage Focaccia, Courgette 'Spaghetti' with Chilli and Sweet and Spicy Roasted Chickpeas (see these at FabFood4All) and Baked Rosemary Polenta Chips. Sweet Snacks is full of recipes for lovely treats like Rainbow Biscotti Cubes, Spanish Olive oil Tortas and Malted Pumpkin Gingerbread. More sweetness in the Desserts chapter and Izy brings us Boozy Mocha Coconut Layer Cake, Crustless Plum and Almond Tart, Sticky Banoffee Cake with Salted Caramel and a seasonal pear, Frangipane and Caramel Tartlets. The final chapter is a useful 'Staples and How To's' offering with pastries, doughs, butters and sauces and a couple of step-by-step instructions. This is a difficult book to categorise it would interest anyone with an interest in vegan, gluten-free and healthy options. However, there are meat based recipes and sweet treats too. I do think any cook or baker would learn from Izy's creativity. There are a wide range of recipes for all occasions, they are not difficult to make but often slightly quirky or with less usual ingredients, there are also some classics with a twist. Izy brings a lot of originality to her recipes. The photographs have a bit of a sepia feel which, I felt, didn't do the dishes justice and made everything look alike. 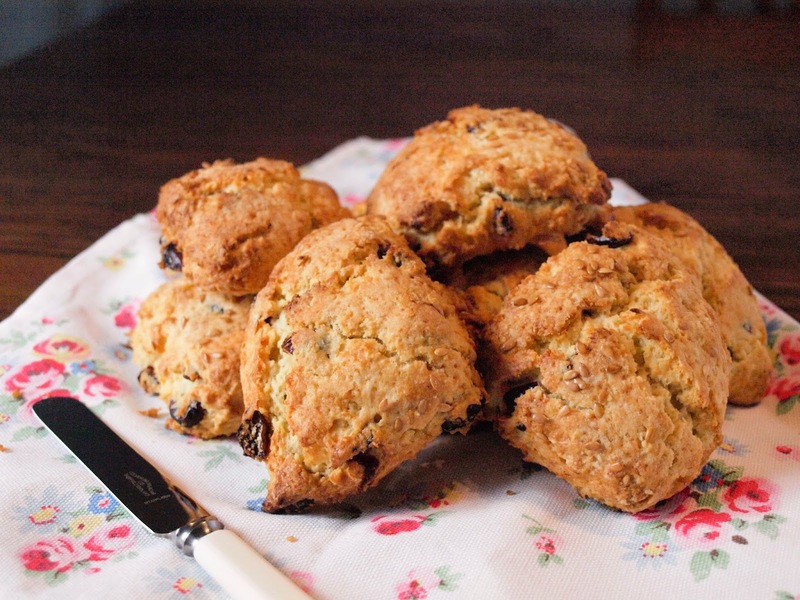 I love a freshly baked scone, so was intrigued by this recipe for Cranberry Flaxseed Scones. If I were making these scones again, I would use slightly less milk as the mixture was quite wet. The scones were very tasty and perfect with the molasses butter which is also featured in the book. 3. Place the first 5 ingredients in a large bowl and stir together. Add the cubes of butter and use your fingertips to rub into the dry ingredients, leaving some pea-sized chunks of butter. You'll have a moist mealy mixture. 4. Stir in the cranberries then make a well in the middle and add the egg and buttermilk. Stir together until just combined. 5. Turn out the dough onto a lightly floured surface and knead it a few times, then roll it into a square 2 cm (3/4in) thick. 6. Cut into 9 squares using a sharp knife, then transfer the squares to the lined baking tray, placing them 2.5cm (1in) apart. 7. Brush the tops o the scones with buttermilk and sprinkle with demerara sugar. 8. Bake for 25-30 minutes until browned and risen. Serve with salted treacle butter. I was sent a copy of Top with Cinnamon to review, I was not paid for the review and all opinions are my own. Nice review Janice, you do them well. 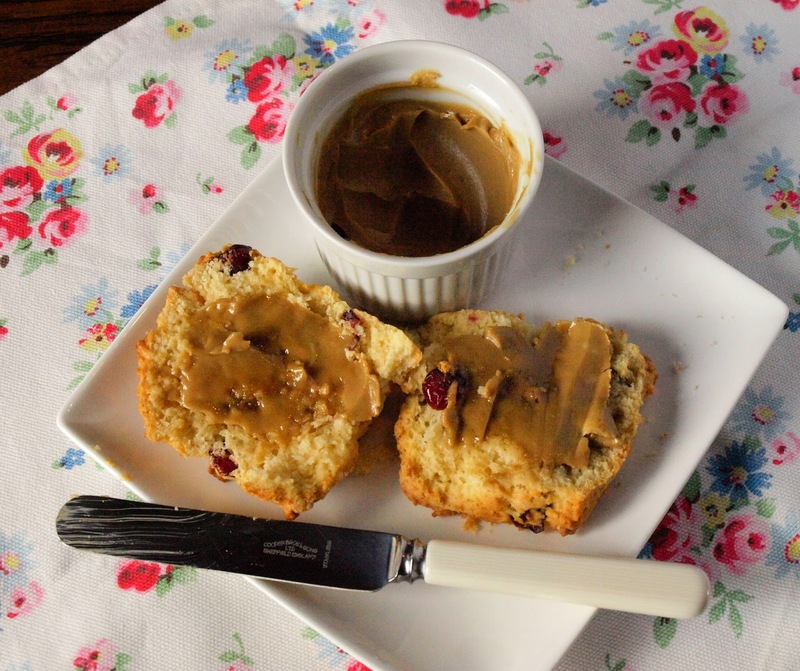 Your scones look delicious especially with that molasses butter - mmm! Thank you kind sir. I am a bit obsessed by cook books and having bought so many duds myself I try to give as much information as I can to my lovely readers. Thank you. I am in love with molasses butter since I tasted it in Nova Scotia. Now that sounds like a book right up my street, I love more creative healthy recipes! Shall look out for it. The scones look and sound very nice too, as does the molasses butter. I like the sound of this book, and that salted treacle butter looks incredibly moreish. 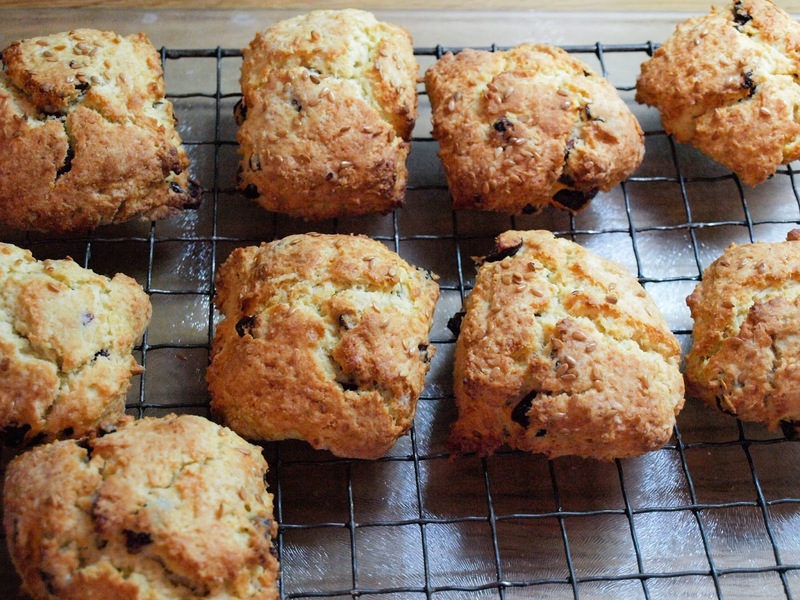 Love the rustic and home madeness of those scones and they are good for you too - bonus! I need that book big time.Lovely scones too.